The new INFINITI luxury car or SUV you’ve always dreamed of is available now at our INFINITI dealership near Franklin Park, PA. 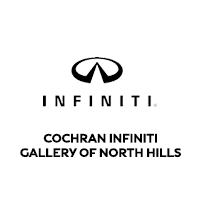 Whether you’re interested in financing a new INFINITI QX50 SUV or you want to explore your new INFINITI QX60 lease offers, you’ll find a variety of amazing options when you shop at Cochran INFINITI Gallery of North Hills. Want a new INFINITI Q50 sedan or INFINITI Q60 coupe? We’ll help you compare new INFINITI models to find the perfect match. Visit our Pennsylvania INFINITI dealership to enjoy INFINITI QX80 finance specials or to lease a new INFINITI Q70 model you love!